I thought the next post would be about the cake but I wanted to sneak this one in first. The cake post should go up on Saturday. I hit the $1 rack of t-shirts at Goodwill and picked the brightest t-shirts they had in size adult medium. I even bought some of the ones with the ugliest possible front graphics figuring nobody else would ever buy them. The only criteria I had was that the backs be completely plain and that there were no side seams. 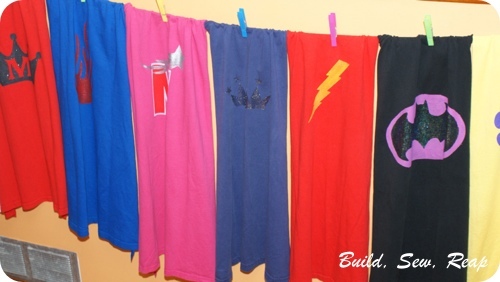 Once I cut them all out (over several evenings), I began using my Silhouette to cut out freezer paper to fun designs and painted each cape with a different design. For the party, I printed out address label stickers with each child's first name to stick to the capes so we'd know who should get which cape. So now on to the tutorial. There are lots of tutorials out there but after reading several, here's the process I found was quickest, easiest and produced the best results. 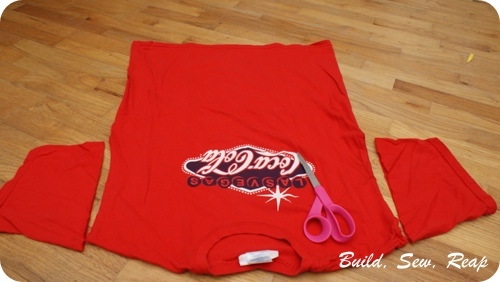 First, lay the t-shirt out flat with the front side up. Cut off the arms. It doesn't really matter which side of the seam you cut on but I found I was able to match up the sides better in the next step if I cut on the sleeve side of the seam. 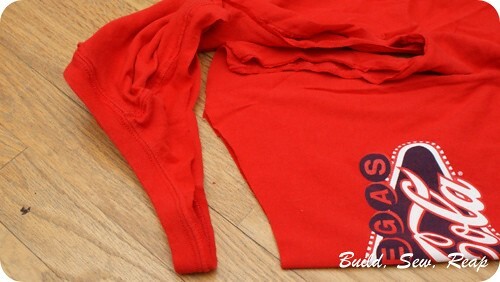 Next, fold the shirt so that the front of the neck line is folded in half together. Don't fold the whole t-shirt in half, you more need to just grab the very center of the front neckline and fold so then the very center of the back neckline is not folded within it but folded out away from the front. 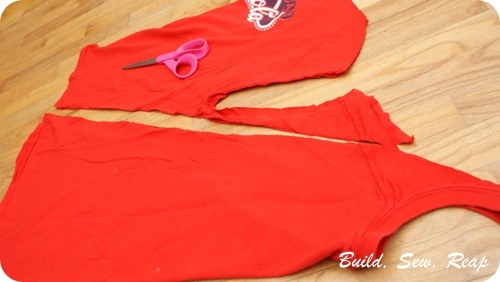 Start your cut at the front center and snip just below the neck ribbing for a couple of inches then angle out so that you cut to the shoulder seam about 2 1/2 inches from the neck hole. At that point, snip to the arm hole next to the shoulder seam. It should now be easier to flatten out your whole project so that the front is folded in half on one side and the back is folded in half towards you. Clip from your last cut all the way to the bottom edge of the shirt while angling out towards the front. The back of the shirt now serves as a fantastic cape with the original neck binding of the t-shirt being the neck of the cape. 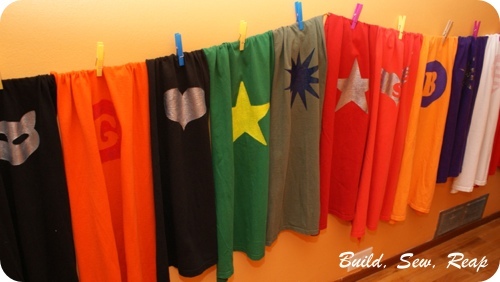 Decorate and give to your favorite superhero! 21 capes?! Are you serious? Now that is a ton of work! 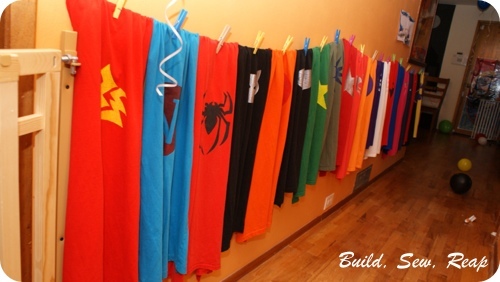 The capes turned out so sharp and I love the personalized designs.